Access 306 continues our advanced Access database development with VBA programming. This lesson focuses calculating employee commission rates and pay rates. Sounds easy? Well we will learn about all kinds of new concepts like DMax, Me.Requery, InputBox, nested IIF functions, and much more. We'll learn how to use DMAX to calculate the commission that he should be paid - based on his sales - according to our commission table. We'll create a form to just show Paid Commissions, Unpaid Commissions, or both. We'll learn the Me.Requery command to refresh the form results when the box is checked or unchecked. We'll create a report we can print out to see all of the commissions our sales reps need to be paid. We'll make a button that we can then click on to mark all of the commissions as PAID, and we'll throw in a little "Are You Sure?" message box prompt. We'll create a button on our Main Menu form with a PASSWORD on it. This way someone has to type in the password in order to open the employee commission form or report. Next we'll work on employee pay rates. We'll learn how to calculate regular and overtime hours, which will let us calculate regular and overtime pay. BRYAN binkerd on 5/14/2009: I think the showings of the mistakes and how to correct them are great, however, I might recommend that if you added that portion to a troubleshooting chapter, it would allow the user to learn the "perfect world" scenario and to recap the user's knowledge and awareness of the troubleshooting techniques. (Chanting "Go Rick, Go Rick, it's your birthday"
I used names rather than IDs to store values. Is there a parameter value such as LIKE "*dummy*" for text rather than ID references. Ruth Spohr on 11/21/2009: I agree with Bryan about a trouble shooting chapter so the lessons are clearer. It also becomes difficult to refer back to the handbooks when you must wade through incorrect methods to find the correct information. Richard Rost on 11/25/2009: I actually get a lot of compliments on the fact that I do cover several wrong methods showing how to arrive at the right ones. I like to show people the common mistakes that they're likely to make because I know I've spent many hours being frustrated by just such mistakes. Don't you feel this is valuable? Chris on 3/16/2010: Richard, the fact you do show the alternate methods and the foibles is what makes your courses so valuable. Seeing the mistakes and your comments takes the material to a whole new level. This is because we are gaining two things: Your notable experience and new knowledge on how to start from an empty database and develop an app that is as complex as this working example. I too have struggled through the interpretation of reading material and have found they cover most of the material; but they all have holes in the material. I have so far enjoyed the opportunity to go right from Acess 101 to Access 306. This material has changed my view of "How Can I Create my Project?" to "I Can Create my Project!". Thank you. At 13:55 a VBA command does not run because we did not Dim our variable (My Reply). However at 18:16, when we use a variable my password without "diming" it, the VBA command runs perfectly. At first i thought it would bring an error but when i tried it on my database, it worked well without "Dim MyPassword". Why does it work in this particular case? You only NEED the Dim command if you have "option explicit" specified at the top of your VBA code. If that's there, VB will force you to EXPLICITLY declare all of your variables. If not, you don't have to. It's GOOD practice to leave this setting ON because it avoids mistakes in your code due to misspelled variables. However, it slows down the development process because you have to take the extra time to manually Dim all those variables. Your call. What is the difference and when do I use each? I have a main form based on a query amalgamating three tables with the main form having the autonumber ID and the two minor tables have a numberID equal to the mainform's autonumber. I click on a button on the main form to open one or other of the minor forms at its related record (IDs related) to enter occasional details in the minor form (which is why it is a minor form and the fields are not part of the main form). [frmBookAppointment] being the main Form. It does not seem to work until I close and re-open the main form - should I use recalculate instead of refresh on the main form? Some of the entries on the minor form affect the calculations on the main form. Kevin O'Malley on 6/24/2011: Hi Richard, I have recreated the DMax formula faithfully but I do not get neither a value or an error message for TeirAmount when I run the query. I am using 2007. How do I spot the problem? Kevin O'Malley on 6/24/2011: I could not get the TierAmount DMac function to work until I changed SalesRepID in the CommissionLookUpT to EmployeeID. After that the function worked perfectly. Joni Moore on 9/23/2013: At the very end when you discuss a quick way to add a password input box, how do you make the password not visible - just masked with *** instead? Just set the INPUT MASK property of the field to PASSWORD. MsgBox "Your request has been canceled or you have entered an invalid password. Please try again or contact your System Administrator. ", vbCritical, "Sorry..."
On other fields there would be an INPUT MASK option under the Data tab of the Property Sheet, but buttons don't have this option. Is there a set of code I could use instead? Sorry, I didn't catch that you're using an actual InputBox function for this. No, there's no way to mask the input in this case. 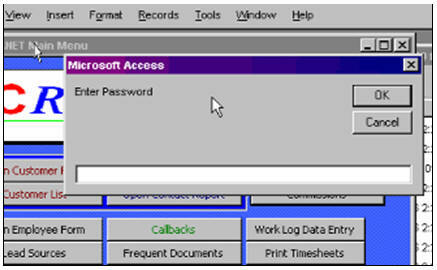 What I have done in the past is to create my own little logon form with a single text box (password) and an OK button. Make it popup and modal, and have the OK button check for the password. I am trying to build a payroll databaase. I am having trouble with pay rates. Would access course 306 help me? Or is it out of date? I have purchased all of your access beginner and expert classes. Could you recommend a class that could help me? Looks like it would cover it. Although its an old course there is no reason why it wouldn't work in updated versions, the UI may look a little different but the concepts would remain the same. Spiros Poulis on 4/22/2016: I am trying to figure out how to amend your example if the commission is progressive. 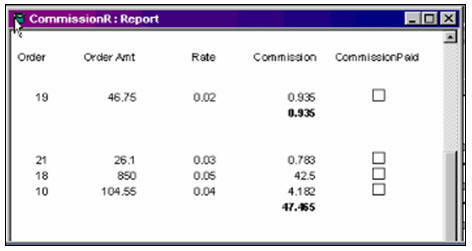 For example for $650 the commission is (50*2%+50*2.5%+400*3%+150*3.25%). Is it possible or i must use multiple IIFs()? You can nest IIFs but it can get messy.